This is the top that I finished yesterday. A little over a week ago, on the day that would have been my grandparents 70th wedding anniversary (though I didn’t realize it at the time because I rarely know what day it is), I started thinking about my grandfather and was inspired to make a quilt for him. So, I began the way I usually do with a quilt design and started capturing the words that came to mind as I thought about Grandpa. 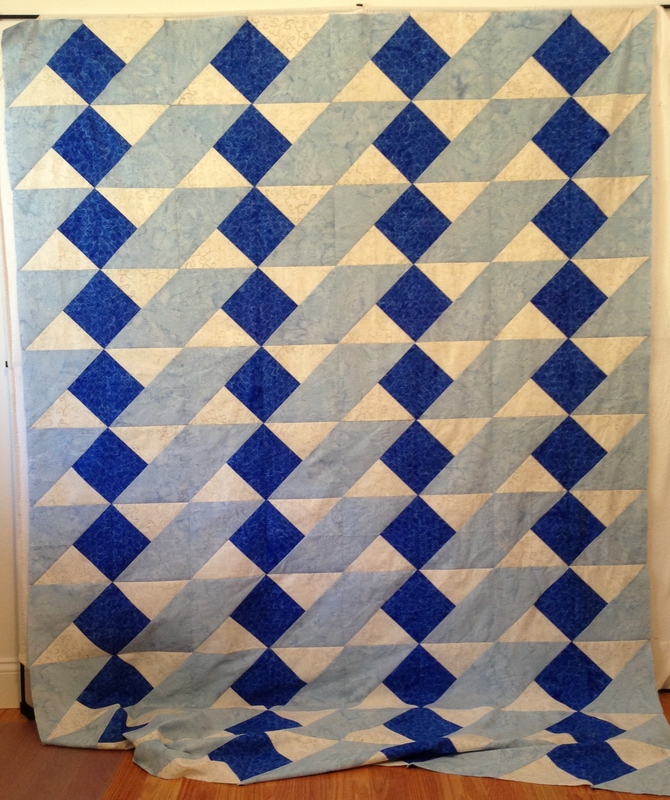 Since he was in the Navy in WWII, that was the first thing that I thought about, which ultimately led to a blue quilt in a pattern that reminds me of waves. The block I used is unbelievably simple, but I love it. I’ve already planned a quilt for myself in which I’ll turn the blocks to run vertically and will add plain strips on either side. The block is a dark blue quarter square triangle from a 9 1/2″ square, sewn to a cream quarter square triangle of the same size. They are then sewn to a half square triangle of the lighter blue (9″ square) and then the block is cut down to 8 1/2″ unfinished. Alternating blocks are rotated to get the wave design. Refreshingly simple.